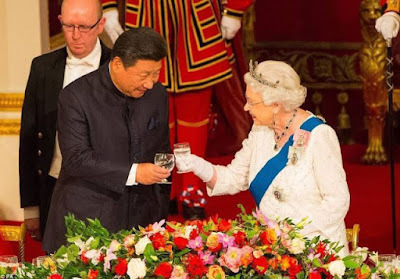 While the rest of the world is discussing unguarded comments made by Queen Elizabeth II saying that Chinese officials were "very rude" during Xi Jinping's state visit last year, Chinese state media has only seen fit to author a single editorial on the subject. “The West in modern times has risen to the top and created a brilliant civilization, but their media is full of reckless ‘gossip fiends’ who bare their fangs and brandish their claws and are very narcissistic, retaining the bad manners of ‘barbarians’,” it said in an editorial. For its part, the Global Times simply shrugged off the Queen's comments: “It is not surprising that there are off the record complaints. Chinese diplomats must have mocked British officials privately." The Queen mocked Chinese officials in private comments that were made public during a garden party in Buckingham Palace. The 90-year-old monarch spoke candidly with the officer in charge of security during last year's state visit -- which was said to have kicked off the "Golden Era in UK-China relations" -- while a camera rolled nearby, picking up their conversation. The video and the Queen's remarks have made headlines across the world. However, the official reaction in China has been very muted. When asked by reporters at a regular Q&A session yesterday if that "Golden Era" still continues today, Foreign Ministry spokesperson Lu Kang opted to neither confirm nor deny. Felicia Sonmez from The Wall Street Journal also asked if China thinks that the video was released on purpose. "I think you should refer your question to those who put the footage on the website," Lu replied, though that question was later deleted from the official transcript of the briefing. Meanwhile, a report on the Queen's comments carried by BBC World News was blanked out in China. Last October, both sides declared that the state visit was "very successful." The Queen herself said that it was “a milestone in the unprecedented year of co-operation and friendship between the United Kingdom and China.” Prime Minister David Cameron said that the trip had managed to drum up $58 billion in Chinese investment. With those economic ties in mind, the Global Times sees the Queen's comments as very minor. “The Sino-UK relationship will not be influenced by this. The Golden Era is based on profound interests,” the editorial said. "We have got the Nigerians - actually we have got some leaders of some fantastically corrupt countries coming to Britain." He went on: "Nigeria and Afghanistan - possibly two of the most corrupt countries in the world." The Global Times editorial took a jab at these twin blunders, writing: "But among the Western countries, Britain is one of those that gets caught with its pants down and exposes itself most often.” It's hard to argue with that assessment, following Cameron's remarks, Nigerian President Muhammadu Buhari urged the UK to return assets stolen by corrupt officials. "I am not going to demand any apology from anybody. What I am demanding is the return of the assets," Buhari said at the anti-graft event. Many have argued that while Cameron's comments may have just been foolish, the Queen's comments were publicized in order to cause chaos in improving UK-China relations, as an indirect attack against Cameron and Chancellor George Osborne. The Global Times was quick to reject this claim, saying that "if they had deliberately done so, that would have been truly crude and rude." Sources told The Daily Telegraph that the reason the Queen’s comments were audible on the TV footage was because her clear plastic umbrella, which she uses to allow people to see her while sheltering from the rain, had acted like the cone in a loudspeaker, amplifying her voice towards the microphone. “If she had been holding an umbrella made of fabric, it wouldn’t have happened,” an insider said.